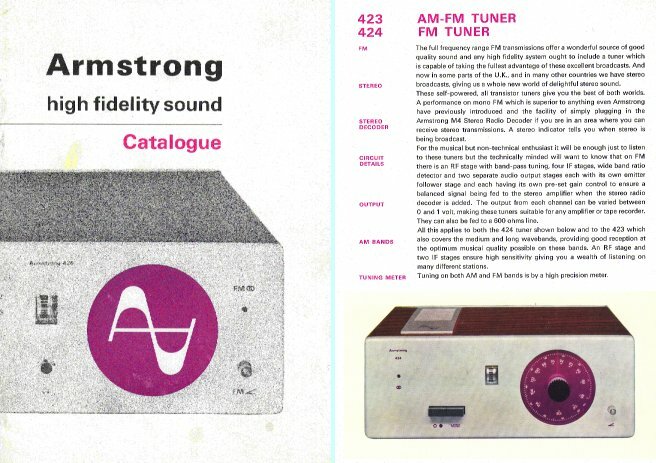 The 400 was Armstrong's first all-transistor series of amplifiers, tuners, and receivers. To go with the new technology, the units adopted a dramatic - almost startling! - new styling scheme quite unlike any previous Armstrong units. The new range was styled in a mix of ivory white and royal purple. The booklets that were issued to publicise the new range adopted the same colour colours. Two 400 range booklets are illustrated on this page. The images above are from the first booklet, released when the range appeared. The images below come from a later booklet. In each case the front cover is shown on the left, and an example of an inner page is on the right. Unfortunately, the copy of the earlier booklet used for these images was a little worst for wear. Hence the above images are not as clean and tidy as they would have been when the booklet was first available. 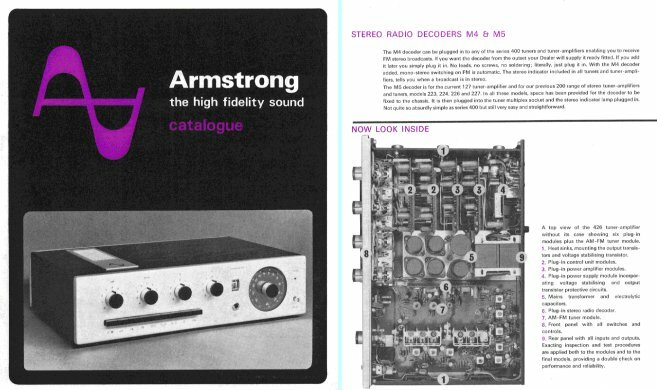 In addition to describing the 400 units, and their stereo decoders, both of the booklets illustrated here also included details of the 127(M) and 227(M) valve receivers. These continued in production alongside the 400 range as a lower-price option for those customers who had a tight budget. In each case the 'M' suffix for a 127/227 indicated a mono receiver with a single amplifier section. The 127 had a single-ended power output valve stage for economy. It is curious to reflect that in the 1960's a single-ended valve power amplifier was seen as a low-cost, low-performance choice. More recently the same topology has become regarded by some as highly desirable, and very expensive examples are now on sale as ‘high end’ equipment!